Applications are being accepted from February 1, 2019 through March 20, 2019. To apply, visit http://cmsdca.gov/index.php/board-of-directors/citizens-advisory-committee-cac. Committee membership is voluntary and there is no fee to join. The Costa Mesa Sanitary District (CMSD) is inviting applications to the Citizens Advisory Committee (CAC). 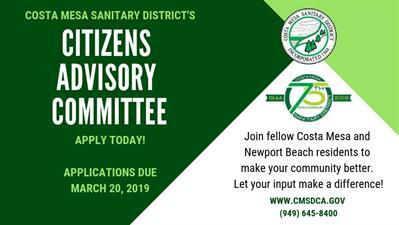 Established in 2018, the CAC gives District residents the opportunity to participate in local government by providing input regarding new programs, evaluating current programs and policies, and offering recommendations to the Board of Directors on key solid waste and wastewater issues. The CAC consists of up to 11 members who are appointed by the Board of Directors and serve staggered 2-year terms. The District is currently inviting applications for five vacant seats. The primary responsibilities of committee members are to attend regular committee meetings, discuss and make recommendations about District matters, and attend at least one Board of Directors meeting per year. For more information or to apply, please visit www.cmsdca.gov or contact CMSD at (949) 645-8400. Applications are due on Wednesday, March 20, 2019.